Christina is an 18 year old performer from Sacramento California. Growing up She always felt more comfortable on the stage singing or dancing in front of a crowd. As an awarding winning artist in school her passion for visual and performing arts truly shines through her work. She has worked in the character entertainment business for 4 years now and has worked with kids her whole life. Call us at 916-246-9980 ext. 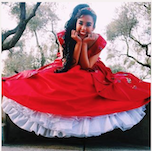 1 or fill out our inquiry form to book Christina as your Sacramento Princess Party Performer in the Sacramento Region. Did you know Amazing Fairytale Parties offers Princess Parties all over Sacramento, Roseville, and surrounding areas as well as Portland, Oregon, Atlanta and Miami? For our Roseville Region princess party clients, we have our very own Princess Entertainers based in your area! To book Christina for your Sacramento Princess Party, Roseville, Granite Bay, Davis and Surrounding Areas be sure to call us at 916-246-9980 ext. 1 or email us at info@amazingfairytaleparties.com.